We are pleased to announce that the print version of Paul’s First Epistle to the Corinthians, by Richard D. Draper and Michael D. Rhodes is now available for purchase. It can be ordered at https://byustudies.byu.edu/content/pauls-first-epistle-corinthians or by contacting the BYU Studies office at 801-422-6691 or 1063 JFSB, BYU, Provo, UT 84602. These formats can be read on various devices and on computers. If you have already purchased an e-book and would like an updated version, if you purchased the Deseret Book version, you should “Archive” the old version and download the new version. If you purchased the Kindle version, Kindle should email you when the e-book has been updated. For further information, please contact the vendor from whom you purchased the e-book. 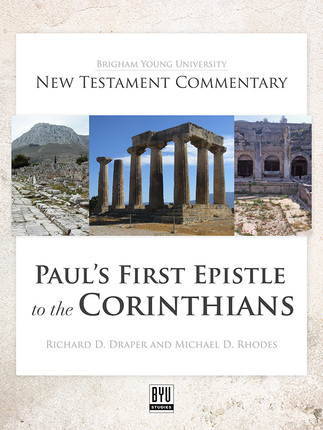 This work is the first comprehensive study of Paul’s first epistle to the Corinthians ever produced by LDS scholars. We include a new rendering of the Greek text into modern English, helping the text be more understandable to modern readers. This rendition is set side by side with the King James Text for easy comparison. It is a commentary of every verse of 1 Corinthians and examines in depth the rich theology of grace, the Atonement, the gifts of the Spirit, the sacrament, love, and resurrection of the dead along with other important doctrines. Those who read this volume will find it enhances faith, hope, understanding of key principles and doctrines, and bears a strong witness of the Lord Jesus Christ and a clear elucidation of his gospel as preserved by the Apostle Paul. Paul wrote for a group of early saints who struggled against some of the same issues that Christians face today. This commentary strives to highlight the ways that 1 Corinthians is a relevant message for our day.